A Splash of Color for the Modern Garden Home by LGA Architectural Partners. 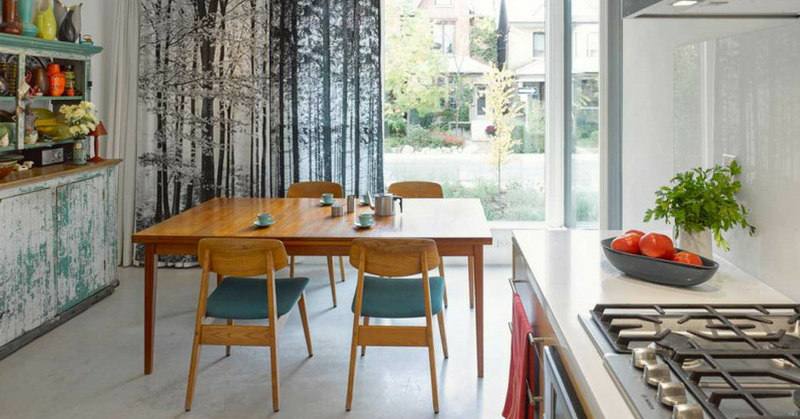 Located in the west end of Toronto, Canada, this old Edwardian home gets a reinvigorated image that adds a modernistic aspect to their beloved neighborhood. Structured to stack on top of each other, these vertical houses upon houses share an easily accessible and generous outdoor yard full of greenery to savor in all seasons. Spread out over 2,800-square feet dwells a sentimental clean ambiance with an airy atmosphere that flows freely throughout the homes. Facilities that function as a library-office leads eyes towards the charming front view, lending an endearing personality to each individual room. A modest budget to work with had the designers push for a simplistic and elegant tone for the interior, reigning in the dining space to have direct entry to the front porch on one end, while overlooking the street through a huge window on the other. Attractive sets of stairs that lead up to a partial level shared between the top and bottom units fully complete the kitchen, dining, and front entrance that they each have. The influence of minimalistic elements open up the house to an enjoyable, simple, relaxed, and overall functionality that is further enhanced by the vibrant mix of colors and the floor to ceiling windows that grant an abundance of natural light to spark up positive moods and good conersations. Photography by Ben Rahn of A-Frame.